Please Note: Emblems are installed on the lid of the pocket. If you do not order a pocket with your emblem, we will assume that you do not want it installed and will send it along with your package uninstalled (with necessary mounting hardware for you to install as you see fit). These items are completely customizable. 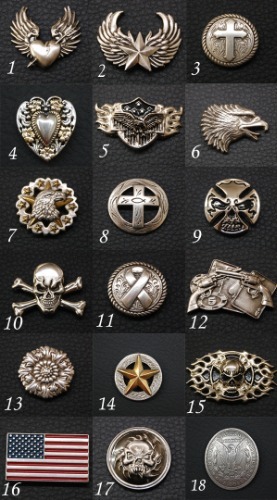 We offer common options like a pocket and studs, but we also offer emblems and colored thread to really allow you to personalize your item. 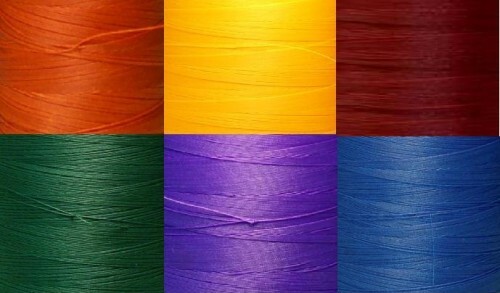 See the image below to view the colored threads we offer. Please note that due to different screen settings, these colors might look slightly different in real life. We are happy to provide a free sample of any colored thread if you have doubts. This tank bib will fit any Honda Shadow VLX 600. These are very easy to install, attaching to a bolt to the front of your tank, and to the tank mounting bolt under the seat. This bib is hand made from black marine grade simulated leather that will withstand the elements very well. This material is also scratch resistant, so you will get superior protection for your gas tank. It can be wiped down with water or any material cleaner/protectant to make it shine.